If you ask anyone at BP about its 3-D seismic program at Prudhoe Bay this winter, they’ll tell you it’s a big deal for the oil company. Take Richard Beavers, a seismic health, safety and environment expert at BP who is helping oversee the program. He said he’s considering getting a tattoo on his arm to remember it by. If you’ve heard the term “3-D seismic” lately, it was probably in the context of the controversy over oil exploration in the Arctic National Wildlife Refuge. There were plans to do 3-D seismic in the Refuge this winter, but those plans didn’t pan out. But you might still be wondering: What is 3-D seismic? And why do oil companies do it? This winter, a visit to already developed state land next door to the Arctic Refuge provided a good primer on what 3-D seismic technology is all about. The basic purpose of 3-D seismic is to look for oil, so it might seem odd that BP is doing it in a place where oil was discovered long ago. But today, Prudhoe Bay is sending a lot less oil down the pipeline than it did when it started up over four decades ago. BP, which operates Prudhoe Bay, has worked hard to flatten production there after years of decline. “We’re looking for small pockets of oil that haven’t been produced yet,” said BP’s Robert Pool. Pool is a seismic acquisition specialist for BP. And on a not-too-chilly March day, Pool acted as a North Slope tour guide, showing a group of reporters how 3-D seismic works. We exited a bus and stepped on to a snow-covered gravel pad near the heart of Prudhoe Bay. On the flat horizon, there were pipelines, drill rigs and a big olive-green pump station facility. Here, we got an up-close view of one of the key pieces of equipment used with 3-D seismic: a vibe truck. It’s about the size of a cement truck, weighing in at 93,000 pounds. Instead of tires, it’s on wide tracks designed to help protect the tundra. It rolled along at 3 miles per hour. And every 110 feet it stopped, and that’s when the action happened. A big, flat metal platform slowly descended from the belly of the truck and made contact with the ground. Pistons above the platform began moving faster and faster. Eventually, standing right next to the truck, we could feel the ground vibrating below our feet — a tingling sensation coming from beneath our boots. The vibe trucks perform just one step in a much bigger process. In fact, there are well over 100 workers in vehicles and stations all around the trucks. Some travel in front of the vibe trucks, checking for hazards. Others set up a grid of receiver devices around where the trucks are working. Others, in mobile blue buildings on tracks, direct the trucks and begin the process of downloading the data. The vibe trucks create sonic energy that travels thousands of feet below the ground, echoes off the rocks below and gets picked up by the receivers that record the data. The receivers pick up those differences in the sound waves bouncing back. The array of receivers work together to measure the wave front as it blossoms to the surface. BP processes that data with computer programs to create a “cube” of seismic information — that’s the 3-D part. “Our cube is going to be 400 square miles big, of data,” Pool said. Using the data they collect, BP can piece together a detailed picture of the geology below, helping the company find hidden pockets of oil they haven’t drilled yet. 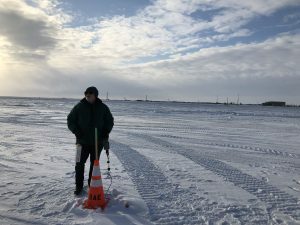 The contractor doing the work for BP is SAExploration, the same company that had been planning on doing a survey in part of the Arctic National Wildlife Refuge this winter. According to Pool, this winter’s survey at Prudhoe Bay is the biggest of its kind ever done in the Arctic. It will ultimately sweep over 450 square miles. “It’s an impressive project,” Pool said. 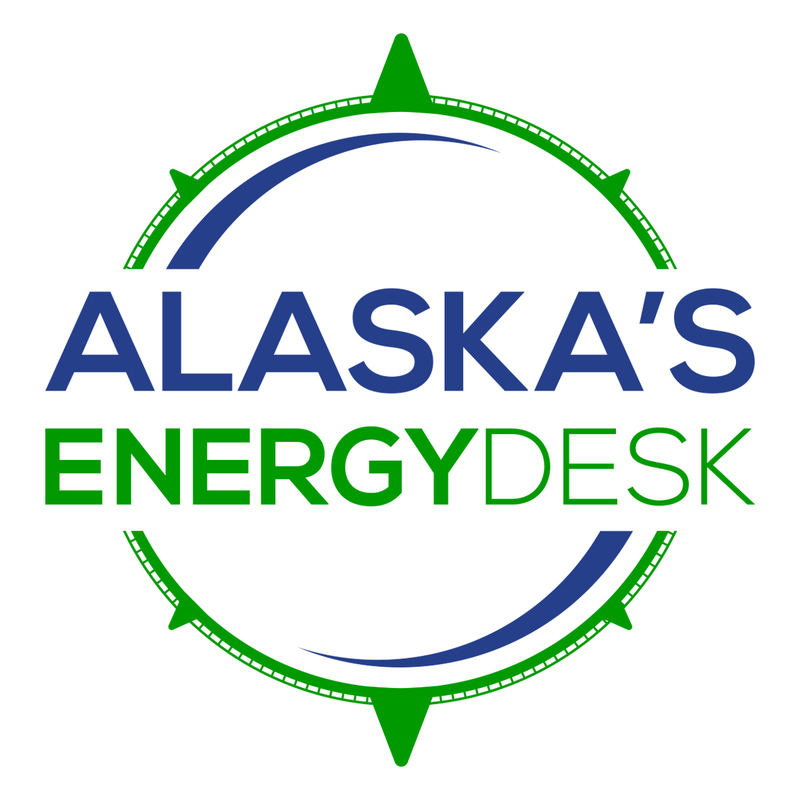 From January until April, the vibe trucks are traveling back and forth — and back and forth and back and forth — making passes from west to east, all across Prudhoe Bay. By March 27 — the day of the reporter tour — Pool said the crew had driven a total of 39,800 miles. “That’s more than once around the world,” Pool said. The team is working in shifts, pretty much nonstop, 24 hours a day, seven days a week. They even bring fuel out to the vehicles as they work. That’s so they can squeeze the whole project in to a single winter season. The state only allows the company to do this work when the tundra is frozen and covered with a certain amount of snow, to minimize damage. BP works to cut down on other environmental impacts during the 3-D seismic program, such as impacts to wildlife. Because Prudhoe Bay area is polar bear habitat, BP needed federal authorization to conduct 3-D seismic there. Before the program started, the oil company did two aerial surveys using infrared technology, searching for potential polar bear dens. Had the company found a polar bear den — which they did not — there would have been a one-mile buffer zone around the den where no 3-D seismic would have been allowed. BP did find three grizzly bear dens in the project area, and those dens have buffer zones, too. Environmental groups have voiced strong opposition to the prospect of 3-D seismic work in the Arctic National Wildlife Refuge, especially when it comes to potential impacts to polar bears. Such opposition has not materialized for BP’s work at Prudhoe Bay. Epstein said her group is against to seismic operations “on sensitive, wild public lands” like the Arctic Refuge’s coastal plain or ecologically rich areas in the National Petroleum Reserve-Alaska. As for Richard Beavers’ polar bear tattoo, he’s not completely sure he’s going ahead with it. But that’s not the only way he’s commemorating the 3-D seismic effort. He’s also growing a beard for the duration of the project, even though he said he’s not really a beard guy. “I’m done with it. Soon as the survey’s over: April 16, the beard gets shaven off for sure,” Beavers said.